Reminder: Nashville Navy Party Tickets On Sale Now! 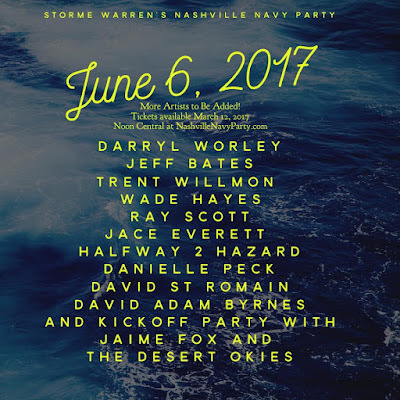 Storme Warren's 2017 NASHVILLE NAVY PARTY, will be held on Tuesday June 6, 2017 at Storme's brand new bar called Famous Saloon on 2nd Ave. beside the Hard Rock Cafe. Doors will open at 4pm with the show kicking off at 5pm. All seating - even ticketed seating - is FIRST COME, FIRST SERVE. All reserved seating is excellent, but those front row seats go to the ticketed patrons who show up first to grab them. Seating is also available at the rooftop bar. Event will be broadcast on the roof and there will be additional entertainment on the roof during the breaks between performances on the first floor. Artists confirmed so far: Darryl Worley, Jeff Bates, Ray Scott, Wade Hayes, Trent Willmon, Halfway 2 Hazard, Jace Everett, Danielle Peck, David St Romain, David Adam Byrnes, and Kickoff Party With Jaime Fox and The Desert Okies. More artist will be added and there will be surprise drop in guests!